Soooo here's my little story of the day. 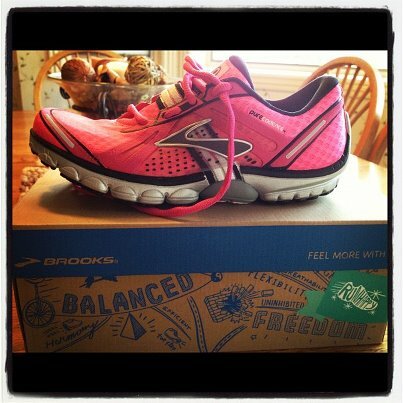 In May, I bought myself a pair of running shoes for my birthday. THE DAY AFTER I got those shoes in the mail, Brooks came out with an all new summer shoe line that had suuuper fun summer colors. They even had my favorite model (purecadence) in BRIGHT PINK! Can anyone think of shoes that say KELLI more than BRIGHT PINK ones? So naturally they have been on my mind ever since. I kept telling myself I really didn't NEED them, but oh how I wanted them soooo bad. After a week of obsessing over them at Lake Powell, the only thing I could do was go ahead and get em! Why not? As some recent trend-setters say: YOLO (you only live once). So yesterday, my favorite pal Rosie and I went shopping for our birthdays. Rosie was on a hunt for stuff for her study abroad in Jerusalem, and I was on a hunt for the bright pink shoes. I went to THREE shoe stores and nobody had them. I figured it probably wasn't meant to be since I got a new pair less than a month ago anyways. I dropped Rosie off and decided to stop buy Runner's Corner just to see if MAYBE they had them, but I was expecting they didn't. Well guess what? They had them. AND, they only had one pair of bright pink size sevens left. It was pure fate. I love love loooove them! How could I say no to these beauties?? They had my name written ALL over them! YOLO, sometimes YOLI we need go to temple! Salen alecum!